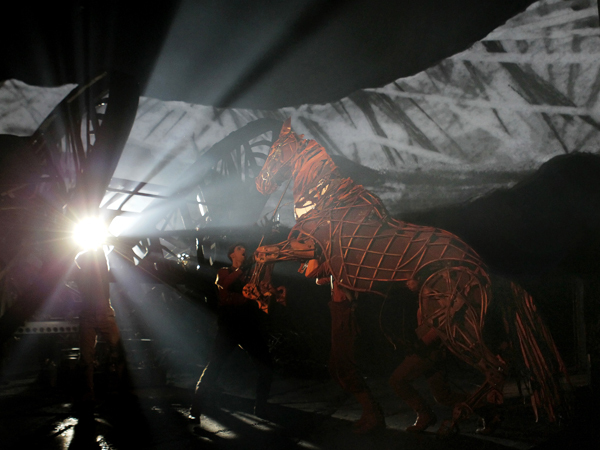 War Horse makes painterly use of nostalgia, elevates ordinary with pizzazz, saccharine and optimism. War Horse (2011) is effective, entertaining and at times exceedingly sentimental, yet audiences and critics seem mostly upbeat and genuinely receptive since it opened on Christmas day. In usual fashion the onslaught of award nods have choked early reviews, stifled objectivity in cases, and continue to blot newsprint and clutter social media margins in a flurry to capitalize on the hurried, the easily impressed, the glitz and romance of holiday-ness. It’s true, Steven Spielberg is right at home in this coming of age story, champion of innocence and cartographer of home spun Americana – it’s difficult to miss-market innocence by way of a cocky colt dragging a plow to save the family farm or the stubborn boy fighting his way to manhood and war. Spielberg is more than well versed on extravagant, big budget epics with expansive sets sprawling into the history books but this time he hasn’t enlisted star power to help him make the delivery. Instead he’s fashioned an unusual combination of character narrators to connect a series of vignettes based on a children’s book and the subsequent adaptation for the theater. War Horse chronicles the life and adventures of Albert and his horse Joey as they grow up together, face the pains of poverty then find themselves thrust apart into World War I where they face unspeakable atrocity with the hope of finding home and themselves again. Being a Christmas release, PG-13 movie it’s clear you should put aside critical, embrace predictable and try to enjoy feel good twists, turns and trials along the way. 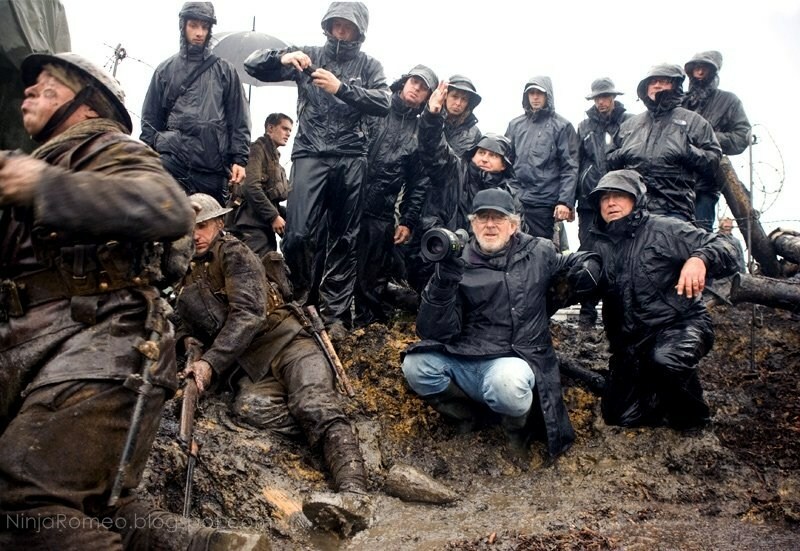 Spielberg handles the material with clear and purposeful choices, instilling the four-legged protagonist with wit and humor, character and charm – he is a master painter in coloring sunsets and farmhouses against a backdrop of war, in fueling the triumph of the underdog to best the horrors people wage against one another with war and politics. Joey is at once our hero and needs little by way of trickery to connect with the audience. Picturesque, painterly paced, a landscape of themes with as much attention to detail as any of his proceeding films, War Horse makes a point of slowing way down, taking Joey’s perspective early so that our connection with him sustains transitions from one vignette to the next. For some the change in little stories might be a little distracting and for some the fact that Spielberg has dedicated most of the first act to character work might be too slow before the first explosion. For others the character work will radiate, the story assembled nuances and calculated vignettes connected so that everyone is moving in the same direction. The heavy lifting required to give us something to come home to his entrusted to seasoned character actors Emily Watson (mum Narracott) and David Thewlis (da Narracott). While young Albert Narracott (Jeremy Irvin) wears doe-eyed adolescence a bit thin he’s no less convincing and very confidently takes his charge to carry the first act and establish the cornerstone to the story. This might be Albert’s story but it is Joey who makes it so and Spielberg wages everything on our willingness to go along for the ride. Rich in detail, lovingly brought to life with specificity, it’s impossible to criticize Spielberg’s war time melodrama as anything less than entertaining. Sure, you’re advised to remind yourself from time to time that you’re watching a PG13 story before the movie does, but there’s quite a lot to like about a Spielberg war and the special way he brings gutsy performances together. Picking up with long time collaborator, veteran lens smith and multi-award winning cinematographer Janusz Kaminski (Saving Private Ryan, Minority Report, Schindler’s List) the duo ensure elaborate set pieces and lengthy battle sequences fill the theater with devastation an awe, commanding the big screen and pushing sound and picture to full effect. The war scenes are riveting, meticulous and sometimes too close for their own good – Spielberg emerges the viewer in the war to underscore the gritty realism with trademark zeal. The scenes with Joey are thoughtful and emotive, touching a level of expression that would be hard not to connect with. Spielberg goes to great lengths to ensure that a horse as the central character does not feel gimmicky, though it should be said you better embrace this aspect early. Joey is much more than a tether line though, and provides a foundation upon which the entire film rests. Joey transforms along with the characters who come in and out of his life, each affecting one another and passing on a little of their story in the process. A glimpse behind the scenes reveals the extent to which live action, CGI, animatronics and a host of other technical achievements were employed to make all of this work. Deep into the war there is a particularly powerful scene where a frightened Joey charges blindly through the battle field and ends up imprisoned in a web of barbed wire and the ensuing scenes where soldiers from either side unite to help him is not only a highlight in the film but incredibly poignant and moving. If Spielberg stumbles at all here it is that he constantly tries to spin closure into optimism, wrapping loose ends together for the sake of well-being, for justification. It’s easy to spot his sense need to punish bad people and help the underdog, to go too far to tidy things up instead of allowing them a certain amount of ambiguity and uncertainty. Admittedly it’s a difficult balancing act, especially when working within the constraints of the MPAA’s PG13 rating system, to factor in life lessons and the intersection of morality and justice – just when you think escapism means you can leave all that stuff behind there it is. If Spielberg fails at all it is that he often relies on rough cut archetypes with singular purposes and obvious contributions to flesh out his supporting characters. These are the guys who arrive with the message from the front just in time on the horse that dies at the doorstep – or the soldier who helps the other soldier who will be sticking around cut barbed wire, exchange a smoke, leave some sentiment behind then disappear into the inky night, presumably the victim of war and circumstances. The result is too much like the last time and they come across as uninspired, flat, plot devices alone. It’s not always possible to give these characters enough time and space to do more, especially in a movie with a horse and horses to contend with, but leaving without a way into the center stage is unnecessary. Here Spielberg moves Albert’s mother and father around like pawns, a place to land and take off from then nothing until it’s time to see the sun set one last time. Then, rushing to complete one stage of the journey he brushes over bad guy soldiers and moments with individual soldiers that you can’t help but feel have a specific charge in the story and then they aren’t needed anymore. Spielberg knows how it’s done and he’s done it all before – a good example can be found in Ralph Feinns as Amon Goeth in Schindler’s List – on one side a monster capable of killing indiscriminately from the balcony of his house and on the other a man fighting deep-seated hatred and the Jewish woman prisoner he can’t help falling in love with. This is powerful stuff for a relatively minor character – perhaps not exactly a supporting role but the effect is the same. The more attention given the character rather than just the role they play, the plot device, the easier it is to accomplish a great deal more. There I go wanting more from PG13 again. If Spielberg makes any mistakes at all they are inherent first in his methodology. His films function according to a set of rules based on romantic idealism. Think of this as the universal truths that require bad guys to get their due, good times to ultimately triumph, the sun the rise the moon to glow bright white in the dark, dark night and from time and time things are simply wrapped up in a blanket that you can carry better out of the theater. Lets think of it as a prescribed order of what must happen in order for the circle of life to be affirmed, not necessary bad or good but there, in capacity. Spielberg makes the most of resolution, he resolves things to instill in the audience a feeling of optimism and well-being. His films often pit good and evil against one another with the triumph of the underdog as center stage, part of the natural order of the universe insofar as happy endings are less about accomplishment as it is affirmation. His films almost always take the form of the journey of the individual and the journey of the universe, clear paths forward with definable beginnings, middles and an end. The end is fundamental. But with all the absolutes popping off like fireworks and star bursts Spielberg succumbs to forced, to inevitable, to the dreaded ‘happy ever after’ ending. But closure doesn’t have to mean a perfect circle and I get that he wants to elevate an overall sense of greatness in the world, warm hearted, elevated spirits, etc., etc. Maybe he can’t help himself but wipe the tear streaked cheeks of the mother’s in his films as the sun is setting and her son returns unscathed from war (War Horse), or reunite a family scattered by an alien invasion (War of the Worlds) against all possibility that they would have survived. In the end the corrupt official who has assumed Godhead must fall (Minority Report) so that a semblance of order is maintained. Yet it is this very ‘semblance’ that is suspect when it posits unknowable destiny when in fact Spielberg’s defined order dictates good triumphs over evil, wrong is righted, no bad deed goes unpunished. Maybe it is most important that optimism win out, that hope is the most valuable currency he shares with us because there are plenty of other films to leave you saddened, forlorn and uncertain about tomorrow. The thing is, Spielberg starts to make heavy-handed choices in the name of achieving this romantic ideal with tidy solutions for otherwise untidy situations regardless of the necessity in wrapping the story up. Granted none of these short comings detract any more than any of his films, but reveal a way in which Spielberg arrives at some of the same conclusions and problems with a mixed bag of successful and not so successful outcomes. 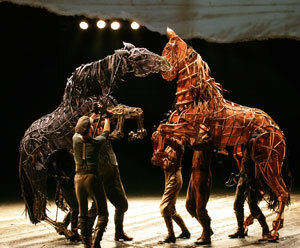 If War Horse happens to end well it is not for lack of the troubling ways in which we get there. The best advice to anyone considering War Horse this time of year or any, is to check your heavy criticism at the door and embrace folly, allow silly to replace stern and no matter how much you want War Horse to be more or less it cannot be. In a way, War Horse – an adapted work based on two other works, one a children’s book by Michael Morpurgo and the other the adapated play by Nick Stafford – is a product of today. In a rush to meet the sort of carnage that fills a Michael Bay film (my review of Transformers here) or touch on the unthinkable psychological gore of a Saw film, perhaps Spielberg meanders a bit too much in the horror, makes room for repeat plays of the same sort of senseless violence and depravity for the sake of commentary; obviously he’s had an illustrative career with which to pose questions for decades, and maybe it’s OK that in the end he gets caught up in it all. The war scenes are devastatingly beautiful and grotesque, the perfect blend of mud and blood, barbed wire and trenches hacked into deep dark earth like mazes stuffed with the living and the dead with little distinction between the two. Some sentimentality weighs early, subsides, resurfaces again later perhaps when we least want it but secretly need it. Hope is a funny thing, you end up looking for it even after you’ve told yourself you’ll feel better without it. Then it appears for a second on the horizon as the sun is going down orange, quiet, mystifying and you need it more than anything in the world and it just feels right. You have to remind yourself that this is every bit a packaged affair for Christmas day and Spielberg has a story to tell, stuff happens, big landscapes and emotional quiet, tears and gentle rewards expected, needed, delivered right next to the same kind of optimism that will carry you all the way home. I found this in transit. It’s a list of movies that were supposed to required viewing before Spielberg would let anyone work with him. It turned out to be false but nevertheless interesting reading. 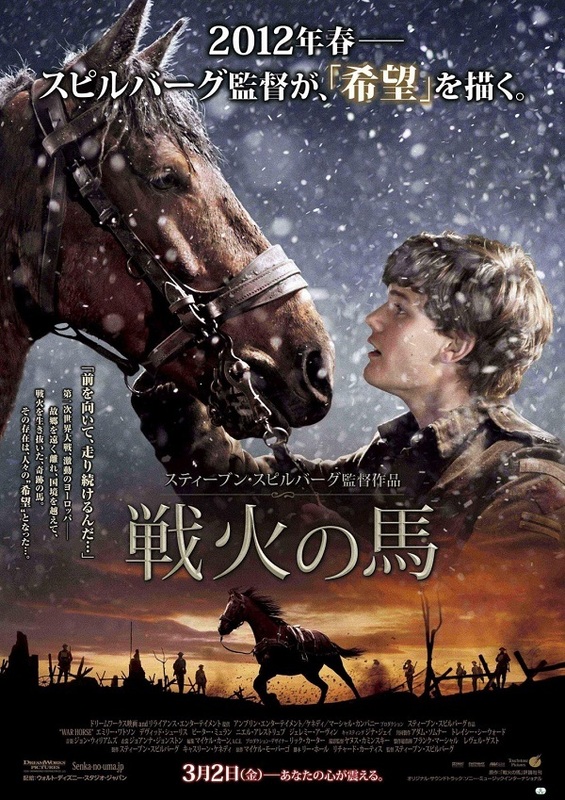 This entry was posted in In Theaters Now!, Movie I've Seen, Movies You Should or Should Not See and tagged 2011 films, above the line, christmas movies, joey the horse, michael morpurgo, practical movie reviews, rory dean, steven spielberg, war horse. Bookmark the permalink. Without a doubt, this is Spielberg trying his hardest to manipulate the hell out of his audience but it somehow works and brought me into the story despite some of the very corny moments. The cat doesn’t really have any big-names either, but they are all great in each of their own respective roles as well. Great review. Check out mine when you get the chance. Recently gave a look to a doco on the making of the stage play version of this story – and I can’t wait to see the film. I’ve heard both good and bad reports about it (some who couldn’t get past some “typical” Spielberg syrup, and those who loved it), but this is about as even-handed a write-up as you could hope to read. Well thought out, insightful and thought provoking; it’s done a great job making me really want to see what all the fuss is about. Top job Rory! Have a great 2012!!! His work combines structural and functional neuroimaging with� � neuropsychological studies of brain injured patients.